A civil advocacy group, OurMumuDonDO Movement, has demanded justice for social media enthusiast and daughter of former governor of old Oyo State, Kemi Olunloyo. 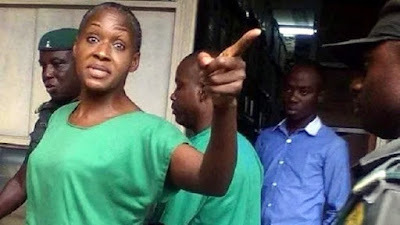 It made this demand in a statement signed by its National Publicity Secretary, Adebayo Raphael, while expressing disapproval on the prolonged incarceration of Ms. Olunloyo at the Port Harcourt Maximum Prisons, in Port Harcourt, Rivers State. Ms. Olunloyo was arrested in Lagos State for allegedly publishing a story believed to be offensive to a popular cleric, David Ibiyeomie. She was taken to Port Harcourt where she was arraigned before a Chief Magistrate’s Court in Port-Harcourt and remanded in prison before the case was later transferred to the Federal High Court. The group said her protracted incarceration belies the fundamental principles upon which Nigeria’s legal system and even the correctional facility where she is being held was established. Part of the statement read: “It is extremely disheartening that one of the finest investigative female journalists in Nigeria has been unlawfully kept in detention since October 12, 2017, allegedly over a controversial issue involving her and a renowned Nigerian pastor. “Even more disheartening is the manner in which the Nigerian people, the Christian community, and indeed the legal system in Nigeria has seemingly become disinterested in ensuring that justice is tempered in this case involving Kemi Olunloyo. “Regardless of whatsoever personal opinion anyone may hold against Ms. Olunloyo, the fact remains that no Nigerian deserves to be treated less as a human as she is currently being treated. The group therefore called on ‘every Nigerian with a conscience’ to speak for Ms. Olunloyo, stating that she needs the voices of Nigerians at this time. “We ask every Nigerian who believes in the principles of Human Rights and Freedom of Speech to demand justice for Ms. Olunloyo not only because she is a journalist but because she is a Nigerian who should be protected by the law, like the rest of us”, it said. The group further urged the Federal Government of Nigeria, the Rivers State government, and every concerned authority to swiftly intervene in the matter and ensure that Kemi Olunloyo gets justice. “We believe that justice delayed is justice denied, and Ms. Olunloyo, like every other Nigerian, deserves better than she is currently being served”, it said.